"Happy Nappers are the perfect play pillow! All you have to do is ring their sleepy sounds doorbell, then wake 'em up and take 'em out. 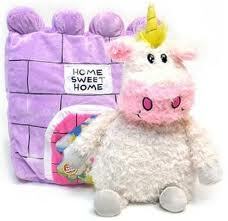 When you're finished playing, just give your Happy Napper® a hug goodnight and return 'em to their Home Sweet Home. Whether it's a Doghouse, Dragon's Castle, Bug Bungalow or Penguin's Igloo, there's nothing like a Happy Napper®, The Perfect Play Pillow®! Best of all, a portion of all Happy Nappers' proceeds will be given to the Home Sweet Home Fund benefiting the Children's Brain Tumor Foundation." What we thought: Want to know a guaranteed way to bring a smile to your little one's face? Gift them a Happy Napper! Seriously, A was soooo happy with her new play pillow and I can hardly pry it from her at school time (I know she'd take with her if she could:) These really are super cute and they come in varieties that would be great for both boys and girls. 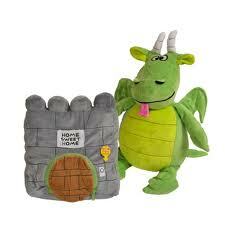 Happy Nappers are ridiculously cuddly and would be great for car or plane trips or sleepovers at Grandma's house. ABCD Diaries gives Happy Nappers an A+! Check out Happy Nappers and use the discount code SPECIAL4U for free shipping.